A Year of Being Here: Maya Angelou: "A Brave and Startling Truth"
Curator's Note: While on a break this past week from managing the project, I learned of the death of Maya Angelou. 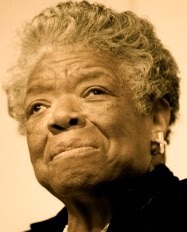 I offer this tribute post in her honor, grateful for the ways she blessed the human community through her writing, her teaching, her struggling for peace and human rights, and so much more. Here she reads her poem "A Brave and Startling Truth" at the commemoration of the United Nations' fiftieth anniversary (1995). It's a long poem, as public poems tend to be, but every word is worth our attention. May we all "come to it." "A Brave and Startling Truth" by Maya Angelou, published as A Brave and Startling Truth. © Random House, 1995. Video credit: United Nations, published on May 28, 2014.